Located just a couple of miles north of Garvin, OK in the far southeastern part of the state, the aging Parker thru truss bridge over the Little River was in such bad shape that officials had closed it to traffic, creating an 18-mile detour and major inconvenience for residents, school buses, farmers and ranchers. Complicating this engineering challenge were significant environmental considerations, including an Indian burial mound site, wetlands, sensitive river waters, and a variety of endangered species of fish and mussels. The potential for years-long regulatory delays loomed large. We worked closely with McCurtain County, Oklahoma department of transportation, the U.S. Army Corps of Engineers and our environmental consultants, greatly reducing time spent gaining regulatory approvals. We tackled those issues head-on, partnering with environmental consultant CC Environmental to develop a strategy that avoided problematic federal constraints. 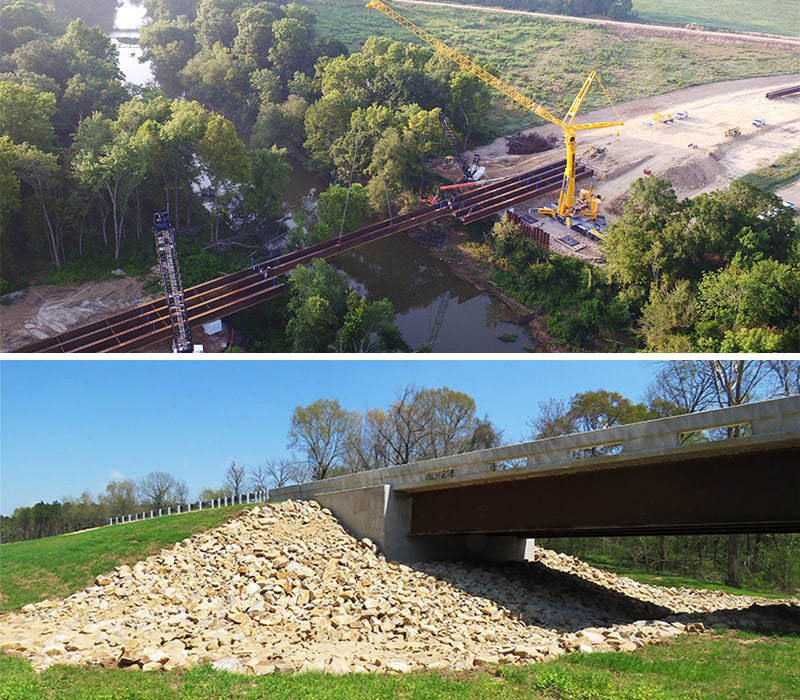 Our solution, as illustrated in the January 2018 issue of Modern Steel Construction, was to design the new bridge where all construction remained outside the Little River’s ordinary high water mark. Our bridge design team proposed a 237-foot-long center span over the main river and its banks, with 100-foot spans on each side. To allow for these span lengths, the bridge used continuous plate girders with integral abutments – making it one of the longer steel superstructure bridges of its kind in Oklahoma. The team made sure to include detailed notes on how to both avoid construction activity under the center span and meet stringent erosion control mandates. Rounding out the project, our transportation engineers incorporated a new roadway alignment that eliminated two dangerous curves. Thanks to innovative design, careful planning, and excellent communication, we prevented lengthy regulatory holdups, making sure this $4 million, 439-foot bridge was built several years sooner than the typical timeline. Creating solutions that meet design and budget demands is the commitment we make to our clients. Delivering results that protect our environment is the commitment we make to our future.